characters or support cards in play? Its a Single Glimpse, but it costs more and has a chance of missing completely. Not good enough. Every faction has things they are strong at and things they are weak at, MU are weak at sacrificing and discarding cards from your opponents deck. This is the only sacrifice effect that MU have and one of a couple of discard from deck effects. It's quite reliable against a mono deck and there are reveal abilities that can improve the targeting, MU can also get cards back from the discard for multiple uses. This is anti prophecy tech and when the next box lands it becomes anti resilient tech, that's when this card will see lots of play. Well, a faction's weaknesses don't greatly affect how we evaluate the individual power level of cards in said faction. 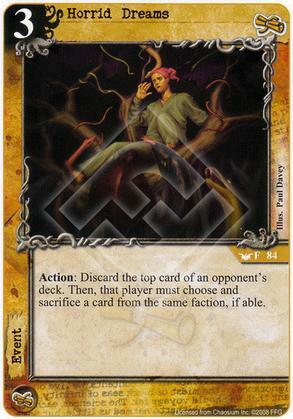 For example, only because Silver Twilight is light on actual card draw doesn't make Crooked Treasurer playable. Sure, there are cases where an inefficient card might be the best choice for the lack of in-faction alternatives. However, most of the time there's just no need to run subpar cards, especially considering that combining and splashing more efficient cards from other factions is very affordable in CoC. Crooked treasurer would be bad in any faction/deck. Crooked cop however fills an important hole in an otherwise strong mono agency build, the fact that he is in a faction that has bad draw makes him a better card. This card is not sub par, in a few ways it's better than single glimpse, and the ability to play an unexpected effect from a mono deck is worthy of recognition. "the ability to play an unexpected effect from a mono deck is worthy of recognition." Okay, let's go with this. I agree. It is not the best card out there, but indeed worthy. Especially in a mono deck. Some also miss the point that it can also remove support cards, not only characters (which makes the comparison to 'a single glimpse' quite unfair). A bit pricey, though, but for one that likes building dreamlands-decks (like myself) it also adds a nice thematic touch. The support option generally makes the card worse, not better. Remember the opponent is choosing which card to sacrifice - hitting any card type just gives him more options.